‘Fahyda’ was built to a commission by James Dearden, Commodore of Scarborough Yacht Club and his son Derek Dearden. James Dearden was 70 by the time ‘Fahyda’ was built and most of the sailing and racing carried out in this ownership was under Derek Dearden. ‘Fahyda’ was built and designed by John A. Ley of St Sepulchre Street, Scarborough. Her keel was laid on 10th September 1949, her hull was completed by 28th Feb. 1950 and she was launched on the 18th of March 1950. ‘Fahyda’s’ overall length is 26.7 feet, beam 7.8 feet and draft 4.5 feet. Her main frames were built of oak, planks of larch (7/8”) and the original deck was pine. She was originally fitted with an 8hp Stuart Turner P 55 ME engine. She was built under ‘day work’ conditions to a high specification. A photograph of ‘Fahyda’ appears on page 95 of ‘Scarborough Sailing Club, Scarborough Yacht Club: A History’ written by W. H. James. The caption says ‘The main was yellow, the spinnaker turquoise green with yellow chevrons, the hull turquoise green - hence the nickname ‘Mills Circus’. Source:‘Scarborough Sailing Club, Scarborough Yacht Club: A History by W. H. James’ p.96. Fifteen Scarborough Class boats are known to have been built. The first ‘Scarborough 26’ was called ‘Marjellen’. She was built in 1949 for a Mr W. Taylor, a member of the Spa Orchestra, who used her as his summer home. She was ‘clencher’ built and had a three-quarter fore-triangle. Later in the same year ’Flicka B’ was built for a Mr Howard Johnston of Hull. She was built to the same dimensions as ‘Marjellen’ but carvel built of larch on oak and the rig was altered to a masthead sloop. After a large number of owners ‘Flicka B’ was returned to Howard Johnston’s ownership and was largely rebuilt by him and kept at Woodbridge. ‘Flyanna’ (ex ‘Fiery Cross’), ‘Fidelia’, ‘Fidesta’, and ‘Kyrah’. In 1953 the design was again altered by widening the midships and after sections, giving a maximum beam of 8 feet. Two vessels were built to this specification: ’Tantulus’ and ‘Fay A’. A RORC Certificate of Rating for ‘Fay A’ dated 1962 shows she has an overall length of 29.58 feet nearly three feet longer than ‘Fahyda’. Presumably ‘Tantulus’ had the same overall length. At the time of writing ‘Fay A’ is in the ownership of Mr Andy Thompson of Fareham, Hampshire. She is moored at Wicor Marine in Fareham. The final and largest modification to the class design was implemented in 1954 when ‘Salote’ was built for a Mr G. C. Payne. She was lengthened by adding 4 feet to the centre section and giving her a counter stern. Mr Payne kept ‘Salote’ at Pin Mill. Years later ‘Salote’ was owned by Dan Houston editor of the Classic Boat magazine. 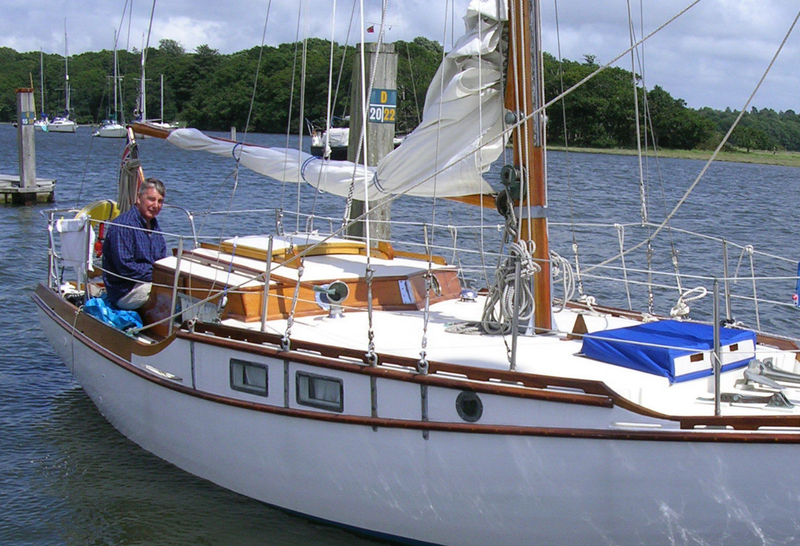 It is thought that he sold her in 2004 to a Mr Roger Josty (Classic Boat, Dec. 2005 p. 69). She is believed to have spent some years moored in Shoreham Harbour. John Ley died in 1954. A RORC Certificate of Rating for ‘Fahyda’ dated 3rd of August 1962 shows ‘Fahyda’ was then owned by a Mr David Steward of Drury Lane, London. She is, therefore, thought to have been sold by Messers James and Derek Dearden sometime in 1961 or 1962 to Mr Steward. A Bill of Sale dated 9th June 1967 shows that ownership of ‘Fahyda’ changed from Mr Steward to Mr Kenneth Fredrick Creasey of Kingston-upon-Thames for the sum of £1,325. There is a Certificate of British Registry for ‘Fahyda’ dated 23 October 1967. It shows that she was fitted with an Albin 10BHP petrol engine manufactured in 1963 which, presumably, was the year in which it was fitted. Her logbook for 1967 shows that ‘Fahyda’ was moored at Birdham Pool, Nr. Chichester. Her original mooring was D59 as it is now (2006) nearly forty years later! An endorsement on the back of the original Certificate of British Registry shows that on the 6th July 1972 ownership of ‘Fahyda’ changed from Kenneth Creasey to Mr Paul Edward Seale of Acton, London. No price is mentioned on the certificate. A second amendment to the same certificate dated 12th September 1973 shows that ownership of ‘Fahyda’ again transferred from Mr Seale to Mr Robert Nicholas Brown of Sanderstead, Surrey. A final amendment to the Certificate of Registry dated 6th December 1978 shows that ownership changed from Mr Brown back to that of Kenneth F. Creasey and Mr Graham N. Creasey who, presumably, was Kenneth Creasey’s son. The boat changed hands for a price of £1 ‘and other considerations’! In total the Creaseys owned ‘Fahyda’ for more than 24 years. On the 25th April 1998 a Bill of Sale confirms that ownership of ‘Fahyda’ changed from Mr Graham N. Creasey to Mr Christopher Hibbert of Lancing , Sussex for the sum of £5,300. Chris Hibbert commissioned a complete renovation of ‘Fahyda’ which was carried out by Coombs Boatyard, Bosham, Chichester Harbour. The work commenced in 1998 and was completed in 2002. The work included a new deck, hull repairs including new frames, dozens of new fittings and a new Yanmar diesel engine. All invoices and receipts for this work are retained together with a photographic record of the renovation. In total the renovation cost nearly £40,000. The keel bolts, which were replaced in 1992, were drawn and found to be satisfactory in 1999. A Bill of Sale dated 5th November 2004 confirms the transfer of ownership of ‘Fahyda’ from Mr Hibbert to Dr John Allen of Littlehampton, West Sussex. The boat was purchased for £18,000. A full structural survey was conducted in October 2004 and found the boat to be in very satisfactory condition. In the Spring of 2005 a new roller reefing genoa was fitted in place of the old hanked genoa, a new tiller was fashioned, the original steering compass was overhauled and a new propeller fitted. She is presently moored at Berth D59 at Birdham Shipyard and is regularly sailed along the South Coast with occasional cross-channel crossings in fine weather! ‘Scarborough Sailing Club, Scarborough Yacht Club: A History’ by W.H. James. Letter from Derek Dearden to Kenneth Creasey dated 7th Feb. 1991. ‘Classic Boat’ December 2005, p.69.